A mum-of-two has opened up about her bizarre addiction to chalk during her second pregnancy. Rebecca Adimore suffered from pica syndrome - a form of obsessive-compulsive disorder sometimes associated with a lack of minerals in the body - and saw herself crunching through 10 sticks a day. Despite the strange habit, the 25-year-old gave birth to a healthy baby boy called Reuben, now 10 weeks old. But this is not the first time the former receptionist from Oldham, Manchester has experienced odd cravings. She said: "When I was pregnant with my daughter, Aaliyah, seven, I would eat toilet roll - but I never thought I'd munch on chalk. "It sounds bonkers, but the urge was so strong, I just couldn't stop." The urge first developed when Rebecca's morning sickness subsided at 16 weeks. Trying one of her daughter's coloured chalk crayons, the crunch and dry texture had her hooked and she went online to buy a box of her own. 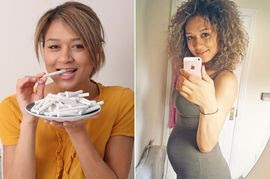 She started eating two sticks a day and even started watching videos of people eating chalk online. But she soon started craving more of the powdery product and decided to buy natural limestone chalk so it would not harm the baby. 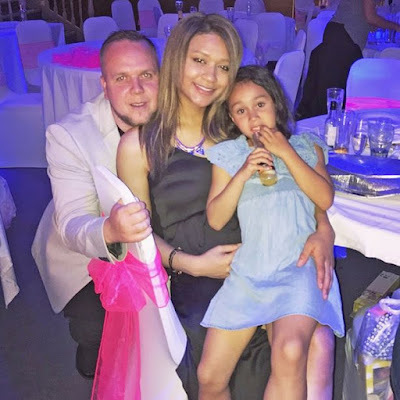 Rebecca said: "Eventually, at around six months pregnant, I was getting through 10 pieces a day, and there was nothing I could do to curb my craving. I just loved the sound of the crunch and the pasty feeling in my mouth. "The sensation was dry and crumbly and the chalk would stick to the roof of my mouth - similar to the consistency of peanut butter. "If I didn't have a bite for a few hours I got groggy." Rebecca loved her unusual snack so much that she preferred it to normal food. She even kept 12 packets of chalk in her cupboards at a time - spending £15 a month. But when she told her partner Danny Lawton, 32, what she was doing he was baffled. Rebecca said: "He thought it was really strange and didn't understand why I was doing it. "I did feel anxious about my baby's health and the effects it might have, so sometimes I would chew the chalk and spit it back out. "It was always more about the crunch than the consumption." But at 32 weeks she decided to confess to her midwife about her cravings. Blood tests showed her iron levels were low and Rebecca was given tablets. Rebecca said: "By the end I couldn't go more than a couple of hours without having a taste. "At work as a receptionist, I would nibble on chalk when no-one was looking." It was only after she gave birth to Reuben on November 2 that her addiction subsided and chalk left a nasty taste in her mouth. "People might think I'm bonkers, but until people experience a craving that strong they really shouldn't judge. "If other women have similar experiences, they should seek advice from their midwife or GP. "There's obviously an underlying reason as to why our bodies crave these things. I'm just relieved my baby son was born healthy."